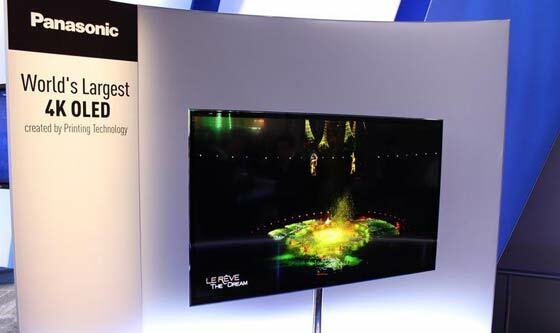 Panasonic unveiled a new 56-inch OLED television at the CES in Las Vegas last night. Reuters wittily reported the unveiling as a classic “display of technological one-upmanship with its South Korean rivals” LG and Samsung. Sony is co-operating with Panasonic on the production of these OLED TVs and screens and it will also be making OLED TVs based on the same 56-inch screen. Panasonic hasn’t revealed many details about the new TV set as yet, the specs and price are not available. We only have the headlining facts; that this is the “world’s largest 4K OLED” and it was “created by printing technology”. Mashable informs us that the printing technology uses RGB to allow a “broad spectrum of colors to be displayed”. The LG OLED TV we reported on a week or so ago, set to ship to users in Q1 2013, has a 55-inch 1080p screen. It would be interesting to compare the colour accuracy and vibrancy between these two TVs as LG’s four pixel WRGB system sounds like it should have better whites, albeit at a much lower pixel density. 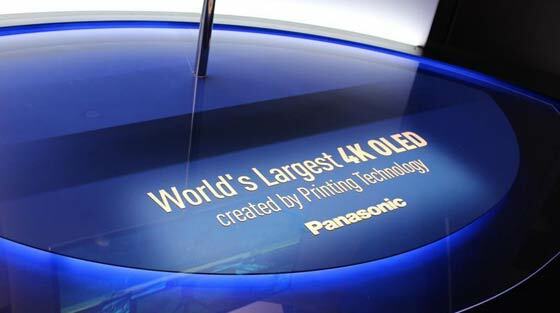 It does seem like Panasonic has decided to go large at the 2013 CES. This time around however it hasn’t “one-upped” anybody, actually Lenovo showed off a much larger tablet, or table top computer, on Monday. You can see the huge 27-inch screened Lenovo Ideacentre A730 in our video here. Panasonic’s 20-inch, 4K tablet is said to be aimed at graphic arts and photographic professionals rather than couch potato content consumers. 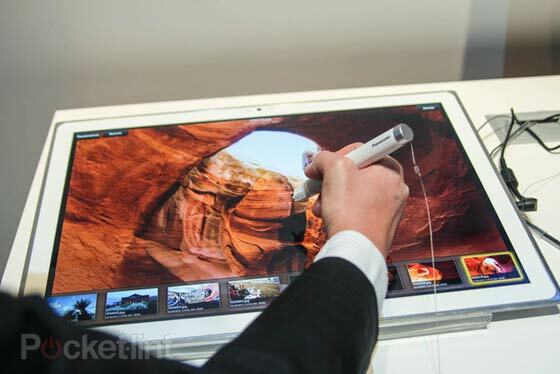 The 20-inch screen, with a resolution of 3840 x 2560, comes with a stylus. The tablet is powered by an Intel Core i5, paired with NVIDIA GeForce graphics, 16GB of RAM and a 128GB SSD. It has a good range of connectivity including Wi-Fi, USB and microSD. The guys at Pocket-Lint were told by a Panasonic rep that the tablet is a prototype that will be manufactured but as yet it’s too early for pricing and availability details. I presume the “RGB” thing means it is not Pentile. And there is now a workable OLED printing process, rather than the vapour deposition process. To be honest, I have no idea how OLEDs are made these days - it was meant to be really difficult to get over a few inches - hence the 11“ Sony display costing $2k a couple of years ago, and now it's 56”! It's what I want but seeing as the non 4k 55" oled's are about £6000 I may wait a few years.